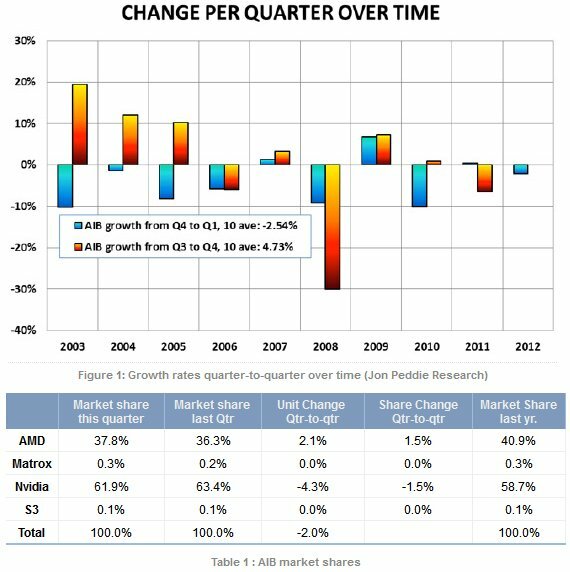 Market research firm Jon Peddie Research reports shipments of discrete graphics cards fell 16 percent year-over-year, but only 2 percent versus the previous quarter (which is better than the 10-year average). Jon Peddie Research (JPR), the industry's research and consulting firm for graphics and multimedia, announced estimated graphics Add-in Board (AIB) shipments and sales’ market share for Q1’12. The JPR AIB Report tracks computer graphics boards, which carry discrete graphics chips. They are used in desktop PCs, workstations, servers, and other devices such as scientific instruments. They may be sold as after-market products directly to customers or they may be factory installed. In all cases, they represent the higher-end of the graphics industry as discrete chips rather than integrated processors. We found that AIB shipments during Q1’12 did not behave according to past years with regard to seasonality, and was lower on a year-to-year comparison and on a quarter-to-quarter comparison for the quarter. Overall, and for the PC market in general, 2011 has turned out to be an anomalous year as businesses and consumers take their own path to recovery. Year-to-year this quarter AIB shipments were down 16%. Over 88 million PCs shipped worldwide in the quarter, an increase of 1.8% compared to the previous quarter, (based on an average of reports from Dataquest, IDC, and HSI). Normally, this quarter of the year is down, and this year’s quarter was no different, but the decline is less than the 10-year average. The change from quarter to quarter is more than last year. Quarter-to-quarter percentage changes are shown in Figure 1. The ten-year average change for AIBs in the first quarter is -2.5%; this year it was lower. AMD introduced the new Radeon HD7900 series early in the quarter and as a result picked up market share. Nvidia got off to a slow start in Q1 and cited two main reasons for the significant decline: The global disk-drive shortage caused by the flooding in Thailand had more impact on the mainstream GPU segment than anticipated. Some PC OEMs were reduced shipments. And the higher prices of disk-drives constrained some PC OEMs’ ability to include a GPU in their systems. Matrox has not developed a new GPU in years but has found clever and imaginative ways to leverage the part they have. Selling to the signage and industrial markets, some low-cost white box workstation builders, the company has completely disappeared from the consumer segment. S3 is similar to Matrox, and is not investing any new R&D in designs since acquired by HTC for its patent portfolio. The integrated graphics chips appeal to low cost segments of the PC market, namely corporate PCs and very low-end consumer machines. Low cost attracts buyers in these categories rather than graphics capability. Thus, entry-level machines use IGP. Embedded graphics processors are simply replacing integrated chipsets, and not having any impact on add-in graphics boards (AIBs), which are holding steady. However, the new embedded graphics processor from AMD, the A10 (Trinity) has shown very good performance and have replaced entry-level AIBs. Year to year for the quarter the market decreased. Shipments decreased to 15.8 million units, down 2.95 million units from this quarter last year.